Poll: What will you have on your pancakes today? 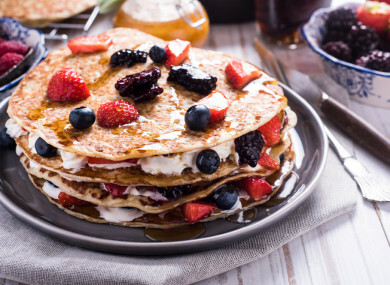 PANCAKE TUESDAY, SHROVE Tuesday, Mardis Gras, Pancake Day, Fat Tuesday – the many names for the traditional precursor to the Lenten period of self-denial. But today is not about getting hung up on a name, it’s about toppings, the options for which are endless. Fruit? Lemon? Sugar? Chocolate? Bacon? Whether you are a sweet or savoury kind of person, there’s always a topping that divides opinion. So today we’re asking: What will you have on your pancakes? Have you a special combination? Let us know in the comments. Email “Poll: What will you have on your pancakes today?”. Feedback on “Poll: What will you have on your pancakes today?”.